Do you have persistent patches of red, dry, itchy skin that won’t go away? If so, you may have eczema or psoriasis. These skin conditions have similar symptoms, so it’s often difficult to tell them apart. But you’ll likely find that doctors often treat them the same way. Both conditions show up as skin inflammation (they look like rashes), according to dermatologist Anthony Fernandez, MD, PhD. The differences lie in their cellular and molecular makeup, he says. What are the basic differences? Psoriasis is a chronic immune-mediated disease. That means your immune system becomes dysfunctional and chronically activated, resulting in skin changes. It causes raised, red, scaly patches on your skin or scalp. 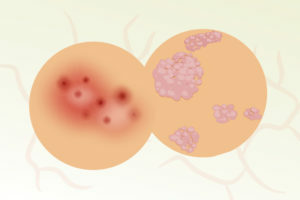 There are multiple subtypes of psoriasis. Plaque psoriasis is the most common and accounts for nearly 80-90 percent of psoriasis cases. People with plaque psoriasis typically have sharply demarcated, raised, itchy, painful red plaques covered with silvery scales. The plaques are most often found on elbows and knees, but they can occur anywhere. 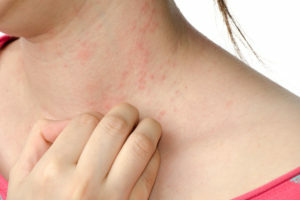 Eczema is an inflammation of the skin that can have numerous triggers. Atopic dermatitis is the most common type of eczema. It typically occurs in people with a personal or family history of asthma, hay fever or other allergies, and it is often seen in children. It makes skin more sensitive and more prone to infection. At any time in your life, you can develop eczema from dry skin or chemicals that contact the skin and trigger irritation or allergic reactions. Neither psoriasis nor eczema is contagious, Dr. Fernandez says. But while you can’t pass them from person to person, they may run in families. Visually, it can sometimes be difficult to tell one condition from the other. 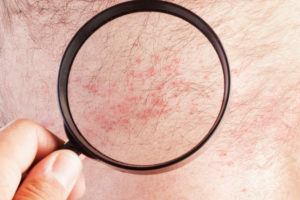 “You have to look at all the clinical aspects of a rash to distinguish between eczema and psoriasis, including the history and the patient’s other medical problems,” Dr. Fernandez says. The common signs — dry and/or cracked scaly skin, itching and red patches or plaques — may show up for either. With psoriasis, the plaques on your skin are likely thicker and have dry scaling. But sometimes that’s not enough to tell between the two with the naked eye, Dr. Fernandez says. A more obvious clue — fluid leaking through the skin (known as a serous exudate) — points to eczema. Though the underlying causes are different, treatment is generally similar, Dr. Fernandez says. You should see a dermatologist for any rash that doesn’t go away with over-the-counter medicine, he says. 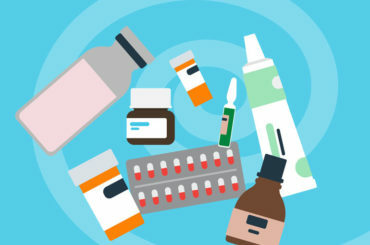 Also, eczema can prompt a secondary infection so your doctor may use topical and systemic antibiotics to remove bacteria and calm the inflammation. How can you ease your symptoms? Dr. Fernandez recommends using a moisturizing cream or ointment if you have either eczema or psoriasis. Keeping your skin moist is helpful because you’re more likely to itch if your skin is dry. There is no cure for psoriasis and multiple types of eczema, including atopic dermatitis. But you can help limit the symptoms by getting proper treatment and taking good care of your skin, Dr. Fernandez says.